Kathleen Eisen of Vandalia, Ohio needs your help. 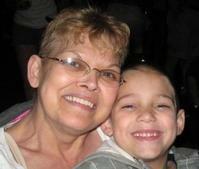 She is a 56 year old wonderful lady, full of life, that is in desperate need of a lung transplant. She has been struggling with a diagnosis of Emphysema since the very young age of 47. About 4 years ago she was put on oxygen, 24 hours a day. Consequently, because of the long hours and stress put on her lungs, she was no longer able to continue working at Grandview Hospital as a patient care assistant. Her only chance of survival is a lung transplant. Initially, Kathleen was working with Ohio State University Hospital for almost 2 long years in hopes of receiving a lung transplant. Due to lack of funding, the hospital is no longer performing these transplants and Kathy is now working with the Cleveland Clinic. Kathy is the rock that holds her family together. She has an 8 year-old young boy, Matthew, who depends on her everyday. With this life-saving operation, Kathy will once again be able to the simple things in life that we so often take for granted. Like walking the dog, riding a bike with her son, watching him play soccer, even small activities such as getting dressed and cooking dinner. To help ease this financial burden, a fundraising campaign in Kathy’s honor has been established with HelpHOPELive (HelpHOPELive). HelpHOPELive is a nonprofit organization that has provided direct assistance to the transplant community for over 26 years. All donations are tax-deductible and are administered by HelpHOPELive for transplant related expenses only. For those who are able and would like to contribute to Kathy:To email this page directly to others in your community, who might wish to learn about Kathy’s campaign, click the EMAIL TO FRIENDS button and type in as many email addresses as you wish. Kathy, My thoughts and prayers are with you and your family.